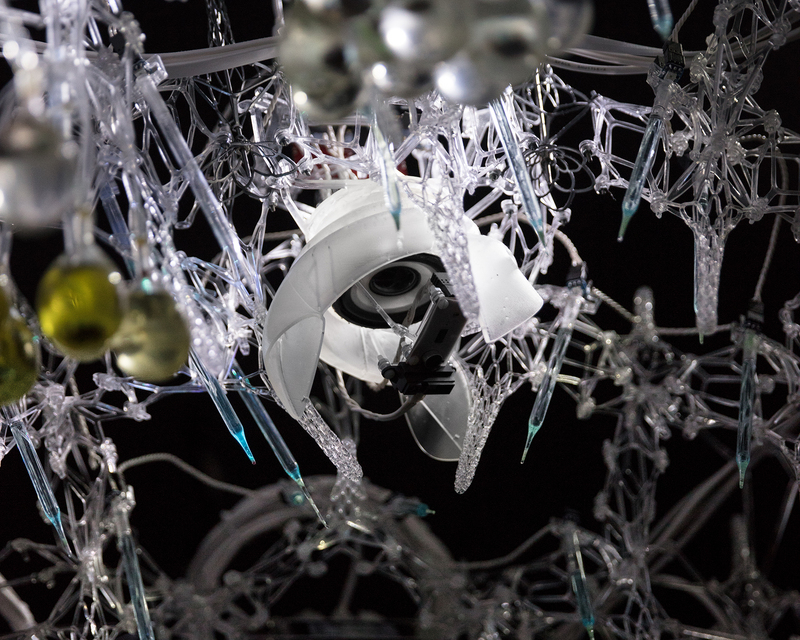 Philip Beesley thinks raindrops are ugly. That is, he believes that the form of a raindrop—a simple, elegant “almost inevitably perfect thing”—represents a polarizing, restrictive view of the optimum in design; one that resists interaction with the world. Beesley is much more interested in complexity. His work pushes the limits of materials and how we think about design. As a professor at the University of Waterloo’s School of Architecture and founder of the Living Architecture Systems Group, his focus is in creating immersive, responsive architectural environments and systems. 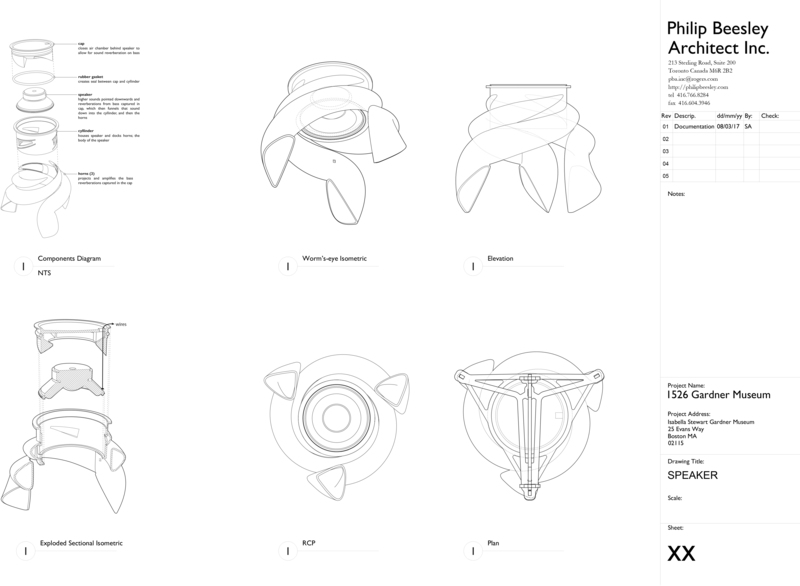 Such designs involve incredibly robust prototyping processes and high degrees of cross-disciplinary collaboration. 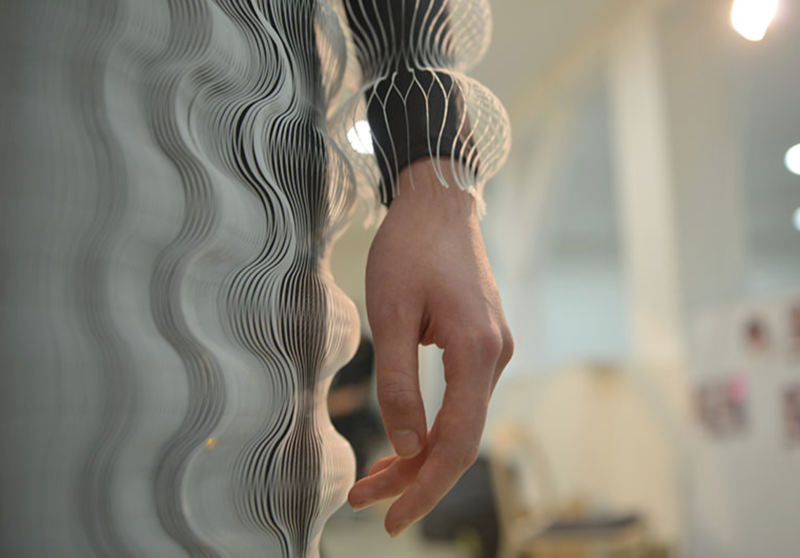 From elaborately engineered installations to haute couture pieces with acclaimed fashion designer Iris van Herpen, Beesley and collaborators’ work cycles through dozens of iterations between both analog and digital tools, including stereolithography (SLA) 3D printing. We talked with Beesley about his design and manufacturing processes, and how SLA 3D printing fits in alongside his array of other tools. He also took us behind the scenes for some specific projects, including Sentient Veil, a piece on display through September 2017 at the Isabella Stewart Gardner Museum in Boston, and his most recent Van Herpen collaboration. What types of tools and materials do you regularly work with, and how has that evolved? Within the studio we have quite a generous arrangement of physical fabrication, ranging from heavy analog equipment to finely-tuned prototyping and instrument-making that moves through a spectrum of materials. Beesley’s work involves a wide range of materials, tools, and processes, including metalwork, casting, moldmaking, laser cutting, 3D printing, glasswork, sensor and actuator systems, and more. Our digital prototyping practice supports multiple cycles of quite intense making, where the prototype might form a mold for analog materials again and vice versa, going back and forth. This supports cycles of empirical testing&ndash;putting things together to see if they stand, if they will they work, and how they behave when they’re loaded&ndash;supporting a general approach of making things out of cells and making things with intense repetition. How does 3D printing fit into those cycles? The presence of prototyping and making molds and models for instrument making, sculpture, and engineered architecture rose in prominence pretty quickly almost 20 years ago and moved through a number of materials. Stereolithography (SLA) 3D printing was present at the beginning, but was ferociously expensive and simply was not achievable at the levels of intense repetition and scales that we were working with. That kind of process would only have been possible for a jeweler or someone working in miniatures or with corporate resources, but certainly not for the tribe of makers and designers that we are part of. The kind of coarse grain that comes from FDM is a very different animal than the type of meticulous quality that can be had within a resin bath when you fuse materials. So it was just absolutely delightful to encounter the Formlabs gear when it appeared. It’s pretty rapidly taken a fundamental part in our studio. We have three machines here. It’s really incredibly valuable to be able to work with something that has such a sense of continuous form and free form in three-dimensional space. Tell us more about your Sentient Veil installation. What role did SLA 3D printing play in that process? Sentient Veil is embedded with many small actuators, rippling light, and a set of distributed speakers that have been custom built in order to have tiny little sample base responses that are amplified by the resonance of the cases. 3D printing was used for direct manufacturing of the extended back-pressure speaker horns. That particular form involves quite precise tuning of the proportion of the sound chamber in order to maintain its pressure and to move a column of air that can take relatively modest sound source through resonance, make the most of lower registers, and make a very high fidelity representation of a sound signal. We were able to focus on freeform modeling of that air chamber with much fewer limitations than if we worked with casting, milling, compositing or thermoforming&ndash;the tools we'd normally use for this kind of chamber, and other relatively short runs of highly-customized pieces. Moving into larger production that would become a moldmaking system which would then be very happily integrated with traditional craft. Rather than printing positives we would print negatives, and then we would detail those with the traditional craft of screws and vents and would use them for casting. The final speakers in Sentient Veil were printed in Clear Resin on the Form 2 SLA 3D printer. How do you balance the process of experimenting with materials and allowing that to guide your designs with reaching an ultimate end goal? [We’re working in] a very different model, which is empirical, which is intensely cyclical, which allows for seeing material computation just as much as ideation; the idea that the thing offers meaning to you by the way it plays and pushes at you and kind of extracts possibility that you have the privilege of listening to and then being driven by. There’s something absolutely delicious in being able to listen and play and be immersed, and for that not to just be somehow an end point, but rather be profoundly formative in the cyclical process. In many of cases it involves seeing where the kind of threshold of tolerance can be. Taking something that might be used in traditional fabrication and turning it into something that can be massively duplicated recursively. It’s kind of an interesting dance, because what we ultimately do is something which has to be repeatable. Not necessarily at industry roll out mass manufacturing, but still by the hundreds and sometimes thousands. It has big consequences to have something be so high performance and delicate or subtle, but at the same time reliable. That’s inevitably an edge that’s found experimentally. 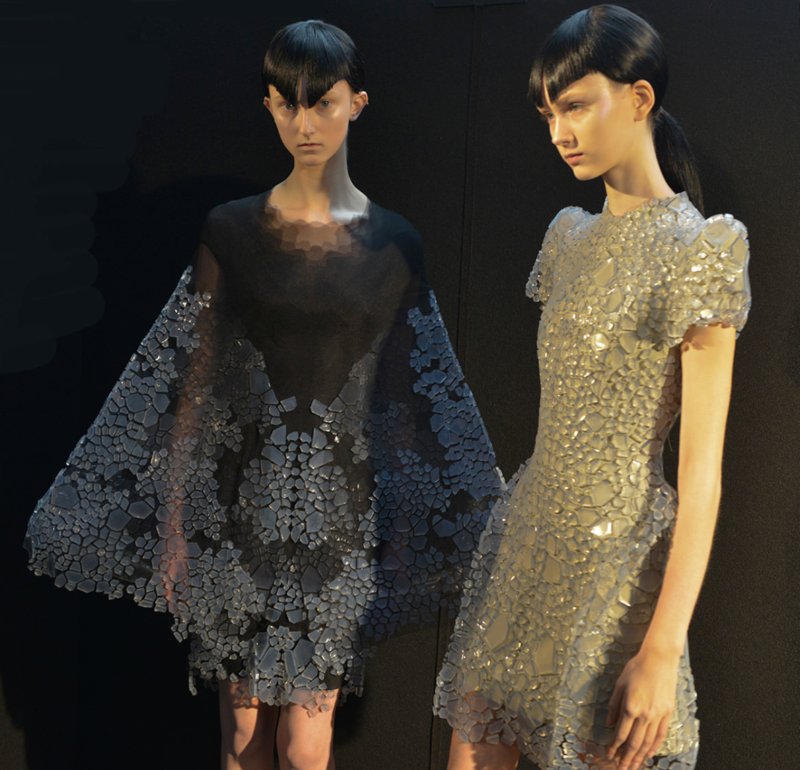 How did 3D printing help with iterating in your most recent work with Iris van Herpen? We’ve been using the Form 2 for a couple of applications of making cellular textiles for couture. One was modeling the original forms&ndash;visualizing them and then using that as a prototyping form that we would aim at in thermoforming, which is much more fluid and volatile, so having the destination of the absolute form was very helpful. The basic dress fabric that we were making with Iris van Herpen was composed of a lace-like series of traced filaments moving over a hemisphere. When two of these lace-like hemispheres are put together, they make a bubble, and then those are combined in multiple sizes to make a bubbling foam-like intense fabric that kind of saturates a body. It’s really an incredibly happy kind of hovering textile joined together with tulle, which is a flexible fabric, that allows the individual vessels to float and move slightly. Beesley has collaborated with Van Herpen for 10 shows. He describes his work in fashion as an expansion of his architectural work. “My collaboration with Iris van Herpen&hellip;takes the responsive environments and the saturated kind of architecture scales and makes it a local shell of possibility around bodies themselves.” Photo: PBAI. We used the Form 2 to make molds involving grooves running along the surface of hemispheres of multiple sizes. [Those molds were] used for injecting and urethaning, so we were very precisely addressing the mold surface and tweaking it and going through multiple generations of balancing things; working back and forth between making the molds, then testing them and trying them out, then making them again. In early 2017 Beesley collaborated with Van Herpen on her couture collection Between the Lines, which included three kinds of fabric—finely cut laser-processed diagrid mylar meshes, molded silicone forms floating on tulle, and polyurethane bubble-forms integrated within clear float-formed panels. Photo: PBAI. More recently we’ve used the general form-making capability of the hemispheres themselves that come out of this as physical molds to laser cut metal into place. These are quite delicate lace-like webworks of metals that are laser cut; the interim forms that are casted for molding forms made on the SLA are used for that. What I’m trying to describe is a pretty robust back and forth that’s going on&ndash;8 to 12 weeks of back and forth. We’re moving pretty rapidly back and forth between things that get miniaturized and used in model form, things that take form as original prototypes, which are then copied in other materials, and jigs for direct manufacturing as well. We also created positive semi-final elements using Flexible Resin. We made molds, we tried casting the molds, and we made rigid version using Clear Resin in order to create a positive. We had quite a bit of back and forth in terms of looking at different designs and subtleties of designs as well. As we speak we’re in the final stages of production, where we’re just doing some roundup metal laser cutting. Van Herpen is known for working with cutting-edge materials&ndash;she’s on the forefront of changes in design. Where do you see the bulk of the industry in terms of multi-disciplinary collaborations and use of emerging technology and materials? One might have thought that with technical breakthroughs there would be a kind of convergence&ndash;in fact a convergence was spoken of a few years ago as being what was happening between disciplines, as if we would acquire new integrative language and would be able to speak in common. But I would say almost the opposite is tending to happen. Things are moving so quickly that there’s a huge amount of specialization happening, and that means that the kind of integrative generalist knowledge that used to be common in, say, the education of an architect, is really quite elusive today. It requires collaboration. In order to make complex adaptive systems that are resilient today there is simply a practical necessity of sharing and working collectively; working in very specific ways. Not unifying, not aspiring to one homogenous institution, but rather working in a very productive, granular way so that the bundle of highly specialized crafts can come together and create hybrids. What that does is produce a very fertile, but rather unpredictable, kind of situation. I would be very hard pressed to say that today we can identify one single institutional method for creating coherence by integrating. It seems much more serendipitous; like the couplings of multiple disciplines produce extraordinary qualities, but they are also, I wouldn't say chaotic, but they certainly are remarkably various and in a tremendous amount of transition. So it’s a necessity; the hybridity exceeds the grasp of individuals, even of institutions, requires collaboration and in turn produces remarkably vivid interchanges. It’s a very very interesting time to be working in this way. It’s characterized by rapid change and some very substantial and striking breakthroughs. In Leveraging Material Behavior in Design, a panel at our 2017 FUSE conference, Beesley and fellow panelists discussed how they merge science and tech with design in ways that challenge traditional thinking and explore possibilities of the future of the way we live and create. Watch a recording of the discussion to hear more from Beesley, and from Marcelo Coelho, Formlabs’ head of design; Stefanie Mueller, assistant professor in MIT’s Electrical Engineering and Computer Science department; and Skylar Tibbits, founder and co-director of MIT’s Self-Assembly Lab.